1d Kiwi - New Zealand Stamps, A 1935 Pictorial overview. 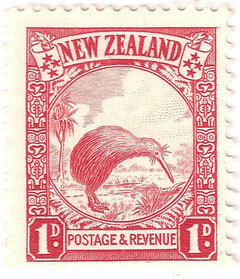 1d, The Kiwi, our iconic kiwi ,one of the symbols associated with New Zealand, was first used on a stamp image in the previous 1898 pictorials. Shown here with a backdrop of a Te Kouka, or Cabbage tree an carved maori 'Door jambs' borders. Designed by C H & R J G Collins.